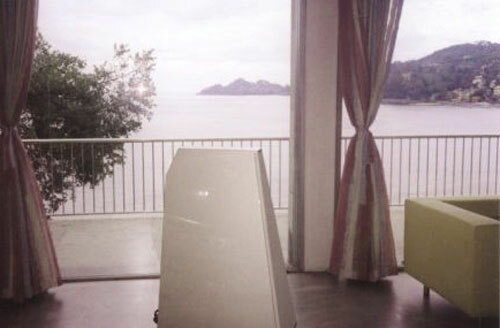 St. Margerita the system consists of an FM 122 MKII Phono Linearizer - FM ACOUSTICS LTD.
A wonderful location above the mediterranean sea with a breathtaking view provides the romantic background for a recently completed installation. The system consists of an FM 122 MKII Phono Linearizer, an FM 255 Line stage and two stereo FM 411 power amps driving the bi-amplified Inspiration System XS-II. Sources are turntable, a DVD/CD player and TV. While the location is a dream, getting a music system to reproduce well in a large, totally undamped room with the floor, the ceiling and all four walls having purely reflecting surfaces is a nightmare. Acoustically the room resembles more a reverb chamber (14m long and 7m wide including 2 sides - about 17m - of glass windows open curtains, only a small carpet, a sofa and a couple of chairs). The owner maintained that this ambiente - attractive from a visual point of view - was not going to be tampered with. Other manufacturers and observers shook their heads: "this will be cacaphonic". It was not deemed possible to get even a half decent reproduction in such surroundings. Only an FM ACOUSTICS system was able to overcome this challenge. Here, the singular damping of the 411 power amplifiers once again proved ideal, excerting ultimate control over the speaker drivers. Together with the unique capabilities of the Inspiration system - which is singular in that it can be calibrated to any room - a reproduction standard was achieved that left experts and music lovers in admiration. "It was really the only system that could possibly give decent results in these surroundings, but how well it performs in these 'impossible' circumstances is simply arresting" explains one of the observers. "Having experienced the Inspiration system several times before, I had hoped that - when playing quietly - it could provide decent reproduction even in such a 'reverb chamber'. The system was concepted and carefully set up by Sergio Pozzi of Audio Graffiti, FM ACOUSTICS' Italian distributor and his chief engineer Enrico Balconi (famous for his immaculate approach and improvements of a wide variety of audio equipment). 'i n c r e d i b i l e'!"